Petitioners march to Malawi parliament to protest attacks on Albinos in the country (file photo). Blantyre — The brutal killing of an albino man in Malawi on New Year's Eve has renewed concerns of attacks on people with the rare genetic disorder, which causes the skin, hair, or eyes to have little or no color. Albinos have been killed in Malawi and some other parts of Africa over the false belief that their body parts can bring good luck and wealth. 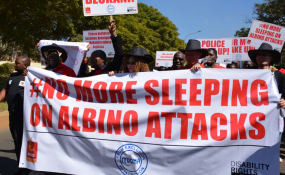 Albino rights campaigners are demanding authorities do more to end the attacks. Malawi police say they are looking for two suspects who broke into 54-year-old Yassin Phiri's house in northern Malawi on New Year's Eve and stabbed the albino man to death. Malawi Police Inspector General Rodney Jose on Wednesday told reporters the attackers killed Phiri in front of his nine-year-old son. "They dragged him outside the house probably to a distance of about 20 meters," Jose said. "Then they chopped off both his hands, they left him battling for his life until he bled to death". Phiri was not killed over of any personal dispute or to steal his wealth - he was murdered for his body parts. Albinism is a rare, genetic condition that causes the skin, eyes, and hair to have little or no color. In Malawi and other parts of Africa, some people believe that body parts from albinos, if used in so-called magic potions, can bring good luck and wealth. Since 2013, 26 Malawian albinos have been killed and 130 injured. Habiba Osman runs a United Nations-sponsored program in Malawi trying to dispel the false belief and end attacks on albinos. She tells VOA this latest murder is a blow to their efforts. "It's really very discouraging, disheartening and horrifying for those especially us who have been in the forefront conducting various activities advocacy activities but also just bringing to the attention of stakeholders on the need to take [care] of these people," Osman said. Osman says a big problem is bringing to justice suspects who attack albinos or steal body parts from their graves. "For example, the Daily Times [local daily newspaper] has recorded that there are 152 cases pending in court," said Osman. "Things like that send out wrong messages to the general public like ah okay, so these people can just complaint about this.' Not many people are being taken to task." The belief in albino body parts having magic is not limited to remote areas or people will low education. Malawian police officers, a medical officer and a Roman Catholic priest were charged last year over the murder of a 22-year-old albino man. The United Nations warned in 2016 that Malawi's estimated 10,000 albinos face "extinction" if they continue to be murdered for their body parts. Overstone Kondowe is the president of Malawi's Association of People Living with Albinism. He blames authorities for not doing enough to end the attacks and the belief in magic. "We are saying like that because the same challenges were also felt with our brothers and sisters in Tanzania and Kenya," said Kondowe. "But due to political will which was also accompanied by actions, these cases are no more." Hetherwick Ntaba is chairperson of Malawi's presidential committee tasked to protect albinos. He tells VOA the government's efforts have paid off - citing only two attacks on albinos in 2018. "You can never wipe out all evil people from a population of 17 million. We are doing everything we can, but there are still some who persist in doing all these evil things," said Ntaba. "It doesn't mean the government is failing, it doesn't mean that the government is not doing anything." Ntaba says members of his committee recently went to Tanzania to learn from their efforts to protect albinos by banning witch doctors. He notes Malawi is considering stronger actions to discourage attacks on albinos, including adding the death penalty for those found guilty.